From here on, the works of Louis-Joseph Soulas were displayed in different international museums in Luxembourg, Boston, Honolulu, Le Havre and La Haye. Along with the British Museum in London and the Chalcographie du Louvre in Paris. Appointed headmaster of the Orléans School of Fine Arts in 1938, he started to teach wood and copper engraving and drawing. At that time, he was also appointed assistant curator of the Cabinet des Estampes du Musée d'Orléans, and the President of the Commission Permanente des Sites du Loiret, representing the minister of National Education and Fine Arts. Thanks to his official position, he developed an interest in the windmill of Lignerolles. It was an old and uncared- for windmill, made of wood, a nostalgic symbol of the past from life in Beauce, and the expression of his childhood memories. 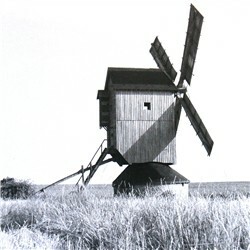 Soulas bought this windmill in 1939, and registered it as an historic site in 1942. From then on, the artist's name has always been associated with the image of his windmill. Because of the war, he had to go to the Vosges at the Wangenbourg Head-quarters. Private soldier under the orders of Général de Lattre de Tassigny, Soulas originally painter of popular pictures started to engrave woods for the Alsatian Army Printing Press, producing naïve hand-coloured pictures representing patriotic topics which looked like the famous images d'Epinal. Later, at the Liberation, four of these pictures were withdrawn as posters and affixed on the walls of villages in Alsace. Made prisoner in 1940, he was sent to Pomerania. There, he drew a lot of scenes of prisoner camps and countless portraits of his captive friends, which he gifted to them. After his release, he produced about forty burins from these captivity drawings that he exhibited in Paris at Gallery Marcel Guiot. In 1941, when he returned to France he found his house in Orléans in ruins. All his collections and sketches were destroyed. However he was not discouraged and started over again.